Jan Arnold's countless performances have yielded a fine collection of videos, CDs, tapes and other memorabilia. Please contact us to find out more about purchasing any of the listed items. Visit our Video and Sound clip pages for excerpts from the performances. 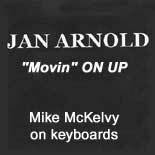 A variety of dynamic music with Jan on guitar and Mike McKelvy on keyboards. Jan's soulful, bluesy rendition of "Sunday Kind of Love" will surely leave you wanting more. From country (Patsy Cline, "If You've Got Leavin' On Your Mind" to blues and swing (It Don't Mean A Thing, Goody Goody)....this album is what you are looking for. 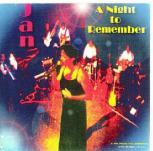 Also included, Jan's hot new original (I Don't Wanna Love You Anymore) 12 songs Don't pass this by....order one today! A collection of songs from 30's & 40's standards to today's country hits! Enjoy a variety of music recorded live at the Calumet Theatre featuring some of the finest singers and musicians in the area. A double CD recorded LIVE at the Calumet Theatre. Includes a variety of songs, duets and ensemble songs with an unbelievable amount of talent, including the "On The Fritz" band, with Steve Jones and Rob Fritz on guitar, John Munson on saxophone, Mike McKelvy on piano, David Reese on bass and "Wild Man" Jeff Oldiges on drums - the band really shines!! Also features duets with Nathan W. Jones, a superb "tenor" with a range that will give you goose bumps!! An eloquent sounding array of traditional and non-traditional Christmas music performed by the "Reel Time" band, with arranger and pianist Charles White at the helm giving this album a "jazzy" sound. Cheery holiday favorites and a few new ones that you are sure to enjoy! Santa (Nathan Jones) performs with the elves (Kirsten White, Jan Arnold) singing background vocals and also sings "Oh Holy Night"! Jan sings several of her favorite Christmas songs including, "Mary Did You Know", "It's Beginning To Look A Lot Like Christmas" and many others you are sure to enjoy. DON'T miss this one! It's sure to be added to your Christmas favorites! A collection of original songs written by some of Jan's close friends in Nashville, TN. Craig Martin who wrote "Don't Take The Girl" has allowed Jan to sing two of his songs on this album, "One Two Step At A Time" and "If Memory Serves Me Right". Also special thanks to Michael Camp for "Spinning My Wheels", Johnny Cymbal for "Let It Rain" and Pam Tillis for "Bear With Me". JAN designed these T-Shirts for her shows at the Calumet Theatre! the performers on the back. A gift you or your friends will love to keep! the entire cast and band! Don't miss getting this one! NEW T-SHIRT OF THE JAN ARNOLD SHOW! !